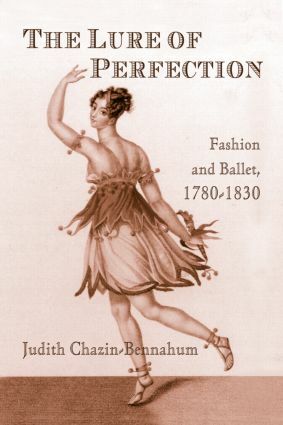 THE LURE OF PERFECTION: FASHION AND BALLET, 1780-1830 offers a unique look at how ballet influenced contemporary fashion and women's body image, and how street fashions in turn were reflected by the costumes worn by ballet dancers. Through years of research, the author has traced the interplay between fashion, social trends, and the development of dance. During the 18th century, women literally took up twice as much space as men; their billowing dresses ballooned out from their figures, sometimes a full 55 inches, to display costly jewelry and fine brocade work; similar costumes appeared on stage. But clothing also limited her movement; it literally disabled them, making the dances themselves little more than tableaux. Movement was further inhibited by high shoes and tight corsets; thus the image of the rigidly straight, long-lined dancer is as much a product of clothing as aesthetics. However, with changing times came new trends. An increased interest in natural movement and the common folk led to less-restrictive clothing. As viewers demanded more virtuosic dancers, women literally danced their way to freedom. THE LURE OF PERFECTION will interest students of dance and cultural history, and women's studies. It is a fascinating, well-researched look at the interplay of fashion, dance, and culture-still very much a part of our world today.